The modified yeast one-hybrid assay described here is an extension of the classical yeast one-hybrid (Y1H) assay to study and validate the heteromeric protein complex-DNA interaction in a heterologous system for any functional genomics study. Tripathi, P., Pruneda-Paz, J. L., Kay, S. A. A Modified Yeast-one Hybrid System for Heteromeric Protein Complex-DNA Interaction Studies. J. Vis. Exp. (125), e56080, doi:10.3791/56080 (2017). Over the years, the yeast one-hybrid assay has proven to be an important technique for the identification and validation of physical interactions between proteins such as transcription factors (TFs) and their DNA target. The method presented here utilizes the underlying concept of the Y1H but is modified further to study and validate protein complexes binding to their target DNA. Hence, it is referred to as the modified yeast one-hybrid (Y1.5H) assay. This assay is cost effective and can be easily performed in a regular laboratory setting. Albeit using a heterologous system, the described method could be a valuable tool to test and validate the heteromeric protein complex binding to their DNA target(s) for functional genomics in any system of study, especially plant genomics. In general, to understand protein-DNA interactions, the Y1H assay is the preferred system successfully used in a laboratory setting 1. The basic Y1H assay involves two components: a) a reporter construct with DNA of interest successfully cloned upstream of a gene encoding a reporter protein; and b) an expression construct which will generate a fusion protein between the TF of interest and a yeast transcription activation domain (AD). The DNA of interest is commonly referred to as 'bait' while the fusion protein is known as 'prey'. In past years, multiple versions of the Y1H assay have been developed to suit specific needs with their own advantages 2. The existing Y1H assay can be successfully implemented to identify and validate interaction of one protein at a time with its DNA bait, but lacks the capability to identify heterodimeric or multimeric protein-DNA interactions. The method described here is a modified version of the existing Y1H enabling researchers to simultaneously study multiple proteins binding to their target DNA sequence(s). The goal of this assay is to express the protein of interest with an activation domain (pDEST22: TF) and evaluate the activation of the candidate DNA regions fused to a reporter in the presence and/or absence of the interacting protein partner (pDEST32ΔDBD-TF) in the yeast system. This assay will allow us to determine whether the interaction between these two proteins is required for the activation of the target. This is a GATEWAY cloning compatible system and therefore feasible to use in a regular laboratory setting. Thisprotocol is based on direct transformation, which provides the ease of co-transformation of different TFs in a yeast system. Thus, it is an advantageous strategy to validate the protein complexes binding to their possible DNA targets for in vitro molecular and functional validation for any system. Current techniques such as Tandem affinity purification (TAP) methods are costly and labor intensive but allow detection of protein hetrocomplexes on a large scale 3,4,5. This modified yeast one-hybrid can be successfully performed in a regular lab setting on a small scale (Figure 1) and is also cost effective. The Y1.5H assay can facilitate researchers across the community to test and validate their hypothesis towards defining the role of multimeric protein complex binding to a common DNA target using a heterologous system. Based on the findings, the hypothesis could be validated in vivo in the preferred system of study. Recently, we have used this approach to define the role of a TF and its mode of action to regulate flowering in Arabidopsis 6. PCR amplify the promoter regions / "fragments" (preferably ~250 - 500 bp) of the target DNA to be analyzed for further cloning into the entry vector using E. coli (TOP10). Upon sequencing confirmation, subclone the positive clone in a compatible pGLacZi expression vector 7 as previously described 8,9,10,11. Transform the yeast strain for promoter integration (YM4271) by homologous recombination of pGLacZi to generate yeast reporter strain as described earlier 12,13. The transformation and confirmation steps of the yeast strain with the DNA region along with the recipe of the media is not described here, as the steps are similar to classical Y1H protocol 9,10,11,12,13. The pEXP-AD502 control plasmid can be used for normalization purposes while quantifiying β-galactosidase activity as previously described 8. Clone the TF or protein of interest and subsequently clone the interacting protein partner into pDEST22 and pDEST32ΔDBD (pDEST32 minus DNA Binding Domain) expression vectors. The transformed yeast promoter fragments and the TF clones are subsequently used further in the protocol. On day 1 (afternoon), start with 5 mL of culture in SD-Ura from a Petri dish or glycerol stock and incubate overnight in a 30 °C shaker. NOTE: This culture can be started from a freshly streaked plate or directly from a 25% or 30% glycerol stock of the yeast clone with the DNA fragment. On day 2 (afternoon), inoculate 10 mL of YPDA media with 500 μL of the overnight culture and incubate overnight in a 30 °C shaker. Day 3 (early in the morning and whole afternoon): Prepare competent cells (early in the morning). Inoculate 100 mL of YPDA media with the 2 mL of the overnight culture and incubate in a 30 °C shaker. Grow this fresh culture until the OD600 reaches 0.4-0.8 (3-5 h). NOTE: Check the OD600 of the overnight culture and make sure that the start point OD600 for this step is 0.1 - 0.2. Use of over- or under-grown culture may prolong the experiment. Centrifuge for 5 min at 1000 x g and 21 °C. Discard the supernatant. Reconstitute pellets in 10 mL of sterile water using a vortex or pipetting up and down. Reconstitute pellets in 2 mL of Tris-Ethylenediaminetetraaceticacid (TE)/ Lithium acetate (LiAc) using a vortex or pipetting up and down. NOTE: Please see the recipe for TE/LiAc in Table 1. Centrifuge for 5 min 1000 x g and 21°C. Discard the supernatant. Re-suspend pellet in 4 mL of TE/LiAc + 400 μL of salmon sperm DNA (10 mg/mL) pipetting up and down and proceed to the next step. Distribute 20 μL of cells per well in a 96-well mixing plate (U-bottom). Add 150 ng (~1.5 µL) each of the pDEST22: TF plasmid, pDEST32ΔDBD: TF plasmid and pEXP-AD502 plus pDEST32ΔDBD: TF (normalization control) to the wells. NOTE: Optimum results are expected with ~150 ng each of pDEST22: TF and pDEST32ΔDBD: TF plasmid for successful co-transformation. Can vary with construct and plasmid expressions, thus need to be optimized with every experiment. Another control pDEST22-TF plus pDEST32deltaDBD can also be included at user’s discretion. Add 100 µL of TE/ LiAc / polyethylene glycol (PEG) per well (mix three times). NOTE: Please see the recipe for TE/LiAc/PEG in Table 1. Cover the plate with a breathable seal and incubate for 20 - 30 min (can be longer) at 30 °C (no agitation necessary). Heat shock for 20 min (precisely) at 42 °C. Centrifuge for 5 min at 1000 x g and 21 °C. Remove supernatant using a multichannel pipette. Add 110 μL of TE and mix. Centrifuge for 5 min at 1000 x g and 21 °C. Remove 100 μL of the supernatant using a multichannel pipette. Re-suspend the pellet with the puncher. Transfer cells on SD-Trp-Leu agar plates. Incubate plates at 30 °C until next step. Day 5 (afternoon): Transfer the cells on new plates using puncher/microplate replicator. Fill a sterile 96-well mixing plate (U-bottom) with 50 μL of TE using a multichannel pipette. Pre-wet the puncher in TE. NOTE: The puncher or the microplate replicator should be sterilized before this step and subsequently later in the protocol. The common way of sterilizing puncher such as immersing it in ethanol (100%; not molecular biology grade) and then burning it to the flame can be applied. Wait for 1 min to cool-off the puncher pins. Caution: If performing the sterilization on the bench; make sure bench is pre-cleaned with ethanol and free of any combustible material around. Wear proper personal protective equipment (PPE). Punch colonies and re-suspend in TE-filled plate. NOTE: If there is a smooth growth on the plate, colonies can be punched directly to the TE-filled plate or alternatively, single colony (in case of multiple colonies) should be picked using a sterilized toothpick to the TE filled plate and subsequently puncher can be used for the next step. Transfer them on new SD-Trp-Leu agar plates for optimal surface coverage. Incubate plates at 30 °C until the next step. Day 7 (afternoon): Start culture to measure β-galactosidase activity. Fill a sterile 96-well mixing plate (U-bottom) with 50 μL of SD-Trp-Leu media using a multichannel pipette. Fill a sterile 96-deep well block with 180 μL of SD-Trp-Leu media using a multichannel pipette. Pre-wet the puncher in media and transfer colonies from plate to the 50 μL of media. Transfer 20 μL of yeast to the 180 μL of SD-Trp-Leu media and seal the block with a breathable seal. Incubate for 36 h at 30 °C shaker. Day 9 (morning): Start the culture for enzymatic measurement. Transfer 100 μL of culture to 500 μL of YPDA media in a sterilized 96 deep well block. Cover the sterilized deep well plate with a breathable seal and incubate for 3 - 5 h at 30 °C with agitation at 200 rpm (until OD600 0.3-0.6). Re-suspend culture and transfer 125 μL using a multichannel pipette on a spectrophotometer plate (measure OD600). NOTE: Caution: Do not dispense the last drop to avoid bubbles, if the OD600 is below 0.3 - 0.6, incubate the remaining cells for 1 - 2 h more based on the reading. The 125 μL culture used at this step can be discarded or transferred back to the original deep well block at user's discretion. Centrifuge the remaining cells in the deep well block for 10 min at 3000 x g and 21 °C. Remove supernatant by inverting. Add 200 μL of Z-buffer and vortex. NOTE: Please see the recipe for Z-buffer in Table 1. Centrifuge for 5 min at 3000 x g and 21 °C. Remove supernatant by inverting. Add 20 μL Z-buffer and vortex. Cover the plate with sealing foil that can resist freeze thaw cycles. Perform 4 cycles of freeze/thaw using liquid nitrogen in a fume hood and then 42 ºC in a water bath (2 min each). Add 200 μL Z-buffer/beta-mercaptoethanol (β-ME)/Ortho-nitrophenyl-β-galactoside (ONPG) (12 mL, 21 μL, 8.4 mg respectively will yield 20 mL solution; always prepare fresh). NOTE: ONPG will take some time to dissolve properly so prepare the solution an hour before reaching this step. ONPG serves as the substrate for measurement of β-galactosidase activity. Incubate up to 17 - 24 h at 30 °C (check in between, if color develops earlier proceed to the next step). Day 10 (morning): Stop the reaction and measure. Add 110 μL 1M Na2CO3 to stop the reaction and record time. Vortex and centrifuge for 10 min at 3000 x g and 21 °C. Take 125 μL of supernatant using multichannel and measure OD420. NOTE: Caution, do not dispense the last drop to avoid bubbles. Calculate β-gal activity: 1000 x OD420 / (time (min) x volume (mL) x OD600 in a spreadsheet. The general plate set-up procedure for the co-transformation of DNA regions in the yeast cells with protein of interest (Figure 2). The plate set-up can be modified according to the need of the experiment and number of DNA regions/fragments tested. After day-5 of the protocol a well-grown and positive plate should be visible as in Figure 3. In our study, the promoter region of 2600 bp upstream from the start of the transcription start site was segmented into six regions or fragments (FR 1-6) 6. In the representative figure (Figure 3), DNA regions 1 and 4 show positive interaction with the protein A and B complex. Upon the measurement of β-galactosidase activity (Supplemental Table 1) only fragment-1 shows four fold induction of the reporter gene activity while the fragment-4 did not pass our internal threshold of ≥ two fold. Figure 1: An overview of the modified yeast-one hybrid (Y1.5H) assay. The layout describes step-by-step procedure of the assay. Please click here to view a larger version of this figure. Figure 2: A simplified representation of the plate set-up for the co-transformation of the yeast cells with protein (TF) of interest. In a general experimental set-up, the plate can be arranged as shown in the figure. The combination of constructs and controls can be modified as per the need and is completely at user's discretion. Figure 3: A representative image of the positive plate (SD-Trp-Leu) for replicate 1 after successful co-transformation. Similar result should be observed with more replicates. Fragment 1-6 represents DNA region; No Fragment is a negative control. All soultions are sterlized before use. Table 1: The recipe for solutions used in the protocol. The table provides the recipe for the stock and working solutions of the major buffers used in the assay. Supplemental Table 1: β-galactosidase activity measurement. The spreadsheet sheet presented here can be used as a template for the measurement of β-galactosidase activity using the formula given in the protocol. The combination of constructs can be modified as per the user's discretion. Please click here to download this file. The existing Y1H standard procedure is suitable for identifying a single protein prey binding to its DNA bait. With various technical modifications, the existing system has been harnessed for defining transcriptional regulatory networks. However, TFs are known to function as a part of complexes involving two or more TFs or proteins, with only some of the TF capable of binding to the DNA. Proteins or TFs which possess only the protein-binding domains and lack the ability to bind to DNA are more likely to work in a complex, preferably with a TF that is capable of binding to the DNA. High-throughput screens using the traditional Y1H occasionally miss those biologically important interactions. Thus, it is imperative to adapt the Y1H assay to detect heteromeric protein-DNA interactions. The method presented here is one such adaptation with the capability to detect protein-DNA interactions involving more than one protein or TF. The unique feature of the described method is the transformation of the yeast via co-transformation, which allows integration of different TFs in a yeast system and further applied to test the binding of the complex to the target DNA regions. A significant merit of this method is its ability to test two proteins with their DNA bait. This method does not provide the information of specific target (promoter) sites but would provide information for the DNA regions. At the same time, use of this method is advised only after the confirmation of the proposed protein-protein interaction. Based on the findings, further experiments such as electrophoretic mobility shift assay (EMSA) or Chromatin-immunoprecipitation (ChIP) assay or other assays suitable for the system of study should be performed to identify the target sites, preferably in vivo if desirable. The application of ONPG based measurement of β-galactosidase activity provides better confirmation than the classical qualitative X-gal assay. However, the overall experimental requirements and the properties of the protein(s) to be tested should be taken into consideration as needed. 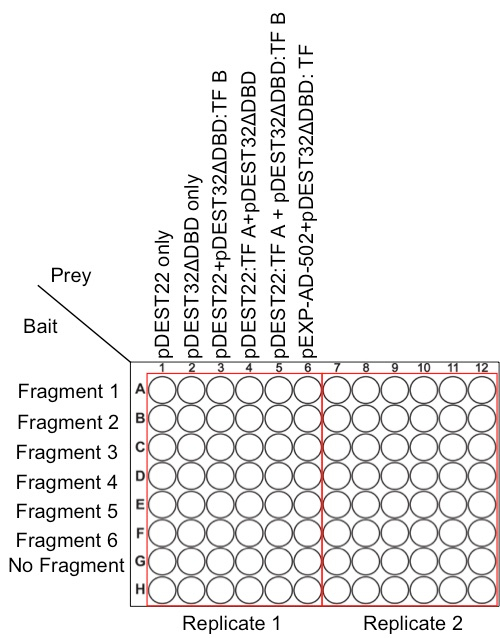 The implementation of the described method for the large-scale screen, using more than two protein partners with different DNA targets needs to be tested. The Y1.5H assay is a cost-effective method, which can be performed on a small scale in a regular laboratory setting. Perhaps, this assay could be performed with use of other vector systems but the protocol needs to be optimized if not using the gateway-compatible cloning system. The presented protocol for the Y1.5H is an advantageous strategy to validate protein complex(s) with their DNA bait for any system of study; plants or mammals. This method is very useful for studying plant genomics where in vivo validation could be challenging given the level of ploidy of the plant and time and labor intensive transformation procedures. Thus, the use of this method can accelerate the hypothesis testing at least in a heterologous system. We thank S.S. Wang, M. Amar and A. Galla for critical reading of the manuscript. Research reported in this publication was supported by the National Institute of General Medical Sciences of the National Institutes of Health under award numbers RO1GM067837 and RO1GM056006 (to S.A.K). The content is solely the responsibility of the authors and does not necessarily represent the official views of the National Institutes of Health. Saghbini, M., Hoekstra, D., Gautsch, J. Media formulations for various two-hybrid systems. Methods Mol Biol. 177, 15-39 (2001). Reece-Hoyes, J. S., Marian Walhout, A. J. Yeast one-hybrid assays: A historical and technical perspective. Methods. 57, (4), 441-447 (2012). Rigaut, G., et al. A generic protein purification method for protein complex characterization and proteome exploration. Nat Biotechnol. 17, (10), 1030-1032 (1999). Puig, O., et al. The Tandem Affinity Purification (TAP) Method: A General Procedure of Protein Complex Purification. Methods. 24, (3), 218-229 (2001). Gavin, A. -C., et al. Functional organization of the yeast proteome by systematic analysis of protein complexes. Nature. 415, (6868), 141-147 (2002). Tripathi, P., Carvallo, M., Hamilton, E. E., Preuss, S., Kay, S. A. Arabidopsis B-BOX32 interacts with CONSTANS-LIKE3 to regulate flowering. Proc Natl Acad Sci USA. 114, (1), 172-177 (2017). Helfer, A., et al. LUX ARRHYTHMO encodes a nighttime repressor of circadian gene expression in the Arabidopsis core clock. Curr Biol : CB. 21, (2), 126-133 (2011). Pruneda-Paz, J. L., et al. A genome-scale resource for the functional characterization of Arabidopsis transcription factors. Cell Rep. 8, (2), 622-632 (2014). Wanke, D., Harter, K. Analysis of Plant Regulatory DNA sequences by the Yeast-One-Hybrid Assay. Methods Mol Biol. 479, 291-309 (2009). Klein, P., Dietz, K. -J. Identification of DNA-Binding Proteins and Protein-Protein Interactions by Yeast One-Hybrid and Yeast Two-Hybrid Screen. Methods Mol Biol. 639, 171-192 (2010). Breton, G., Kay, S. A., Pruneda-Paz, J. L. Identification of Arabidopsis Transcriptional Regulators by Yeast One-Hybrid Screens Using a Transcription Factor ORFeome. Methods Mol Biol. 1398, 107-118 (2016). Deplancke, B., Vermeirssen, V., Arda, H. E., Martinez, N. J., Walhout, A. J. M. Gateway-Compatible Yeast One-Hybrid Screens. CSH Protoc. 2006, (5), (2006). Deplancke, B., Dupuy, D., Vidal, M., Walhout, A. J. M. A gateway-compatible yeast one-hybrid system. Genome Res. 14, (10B), 2093-2101 (2004).